Hearthstone's "Curse of Naxxramas" expansion has come to a close, and Shacknews talked to Blizzard's Eric Dodds and Jason Chayes about how it started, how it's already impacting the game, and what it's teaching the studio for the future. 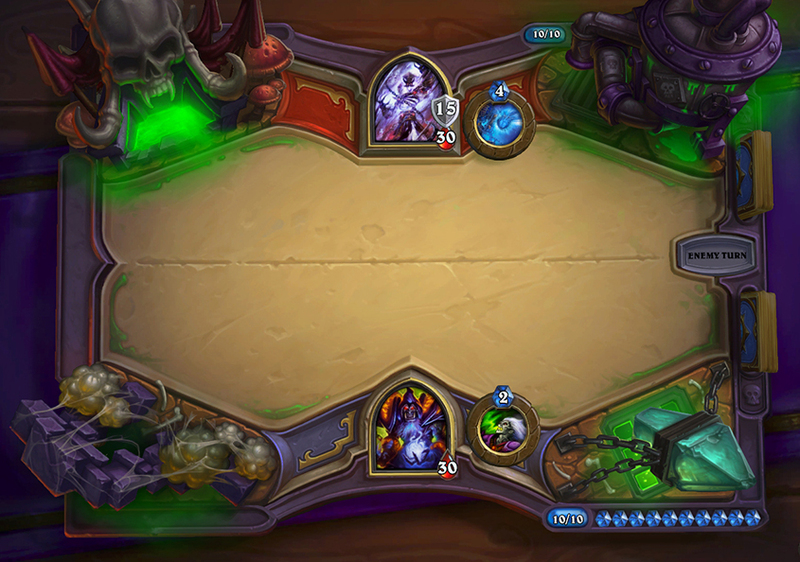 As of yesterday, Blizzard completed its first Hearthstone expansion, The Curse of Naxxramas. The multi-week event spread out 30 new cards with special boss battles. Now that it's finished, we spoke to game director Eric Dodds and production director Jason Chayes about how it started, how it's impacting the game already, and what it is teaching the studio for the future. "We actually started on it earlier than [the official launch]. Believe it or not, this has been in development since before Hearthstone released," Chayes said. "The full team wasn't on it but the initial design started before that. What happened was as the production focus shifted from releasing on iPad and that's when a lot of the focus went to the UI and focusing on how adventures fit." Team 5, the nickname for the small team within Blizzard that made Hearthstone into what it is, is growing rapidly according to Chayes. It's now up to 30 members, and they're working on how to incorporate more members as they juggle upcoming expansions and features. Most of the new cards are very focused on Deathrattle effects, fitting enough for a story focused around a necropolis crawling with undead ghouls. Dodds said this came from a desire to introduce a lot of new elements around a theme, without overcomplicating it. "We wanted to add new mechanics to the game but we didn't add a new keyword or anything that players would have to learn a new concept," he said. "We really liked the idea of doing something with deathrattle because it's a mechanic that's already in the game, so you already know what that keyword means, but it's a mechanic we hadn't done a lot of exploration of the design space behind it. There was tons of space and area to explore, but you already get what it is." Then came the idea of a progressive rollout. Though Blizzard has plans to produce a large expansion with lots of new cards next, the solo "Adventure" mode is serving as a test-bed for future development. Chayes said that too much change at once may be "overwhelming for players," so Naxx served as a prototype to help them get a grasp on how players respond to the injection of new cards. "We're looking closely at that and gauging how people feel about the rate at which new cards were introduced," he said. Dodds added that the progressive release also meant that the game stayed unpredictable for longer. "We thought it would be fun to release just a few new cards each week so the meta never stabilized, not even a little. Every week there's new cards, and just as you're starting to figure out maybe what's going on, there's new cards in the environment. We wanted to make it so people constantly had to explore and innovate." At the same time, he doesn't expect the game to fully settle now that all the cards are released. "If the past is any indicator, people will be guessing for another few months to come," he said. "It takes a while to settle down, and we've had it before where things are stable and then someone figures out a new deck. I wouldn't be surprised if the meta keeps shifting for months to come as people discover weird new combos." What form it that shift takes, Blizzard's guess is as good as ours. Dodds said the team doesn't have a vision or goal for how it wants the new cards to shift the meta. "It's more that we want to provide tools to players to deal with lots of different meta types." As an example, he cites Loatheb. The communmity largely interpreted it as a nerf against the popular Miracle Rogue, but that wasn't quite the intent. "We wanted to build a card so that if you thought you'd run into [spell-heavy decks], you have a tool to deal with it. In general they're intended that, whatever the meta brings, those cards are there to deal with that specific class of problems." That also plays into the solo content itself. By designing the challenges as combat puzzles, Blizzard found a way to train players how to think about overcoming popular decks. "If you look at high-level play, there's an element of combat puzzle there," Dodds said. "You look at the metagame and see whatever deck everyone is playing. If you can figure out how it works and what the counter is to it, you're going to have an advantage for a while until the meta shifts again. We just did the extreme version of that." At the same time, it balanced the Normal and Heroic challenges to fit different player types. The Normal challenges should be doable for most players, because Blizzard didn't want to make obtaining the new cards too difficult. The Heroic challenges are specifically catered to high-level players who might not have felt satisfied by the relative ease of those missions, but in both cases players were meant to be forced to think differently. If you're still having a little trouble thinking differently for the Heroic challenges, check out our guide. Steve Watts posted a new article, Hearthstone 'Curse of Naxxramas': The AfterNaxx interview. Quick question - Can the cards dished out by beating Naxx wings still be obtained by buying random decks? Yeah, the Paladin challenge felt much more luck-based than the others. I get that it's about buffing your minions, but you really had to hit the right combination of cards at the right time to pull it off. I was annoyed because Paladin is my main and it was the most frustrating quest. Not even one Equality? Come on guys.